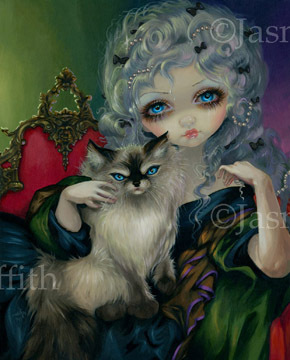 "Princess with a Ragdoll Cat"
From my "Princesses with Cats" series, this painting is a Rococo portrait style piece featuring a princess sitting daintily on a sofa holding a Ragdoll cat (beautiful cats, and so very fluffy!). All cats are beautiful, and I think of each cat I see as being royalty (female cats are called "queens", you know!). The original piece is sold, but prints, canvases & posters are available. This is my own original acrylic painting. And the Limited Edition Hand Embellished Canvases are in my Strangeling eBay store (or contact me directly at JasmineToad@aol.com - they are 11"x14", hand embellished by me in acrylic paints, are $125 and are numbered out of an edition of 25) Click HERE to see the Lt. Ed. Canvas Prints! 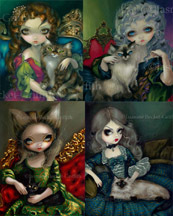 You can now buy the set of ALL FOUR in the Princess with Cats series! Last Chance #25/25 SOLD OUT Lt. Ed. Canvas prints now for auction! 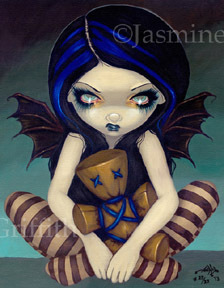 The final, last-ever-made "Lily" and "Voodoo in Blue" Hand Embellished Limited Edition Canvas Prints are #25/25 - no more LE Canvases of these will be made, this is your last chance. Each is 11x14, already stretched on boards with a hanger on the back - ready-to-hang! Each is #25/25 and the final auction on each starts at just one penny with no reserve. This is your absolute last chance for a Lt. Ed. Canvas of these paintings, no more will ever be made. Each is hand embellished by myself in acrylic paints. Let this be a reminder that Limited Edition really DOES mean Limited - once they are gone, they are gone forever. Click HERE to see all of the other Limited Editions I still have available - if you have a favourite, be sure to grab it while they are still in stock. Owlyn Cloth Dolls in stock NOW! 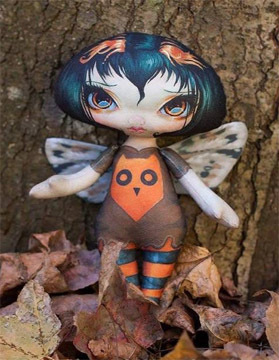 $35 each - My handmade Owlyn cloth dolls are in stock now, but are selling out by the minute. I apologize in advance if they are already sold out by the time this update is released! Each Owlyn doll is made by hand - either by my sister-in-law Sarah or my mother, Julie. Hand crafted and with "detachable" wings (so she can be a dollie or a fairy!) - you can now begin purchasing these Owlyn dolls in my Etsy store HERE . Yes, these sell out VERY quickly, within minutes. Since each is made by hand they take quite a while to make, so they are only available as a first-com, first-served basis. If we have already sold out on Etsy, just bookmark or Favourite our store - https://www.etsy.com/shop/strangeling - Etsy ID: Strangeling - I promise we will be adding more as we keep sewing! Enjoy sewing yourself? You can also buy a kit to sew your very own Owlyn doll HERE- my friend Selina in Australia sells kits of my DIY dolls. More dolls are in the works - new characters too! Truly one-of-a-kind, only one of each card EVER made! Each ACEO is handmade by me, measuring 2.5"x3.5" - tiny trading card sized canvas prints that I have hand embellished in acrylic paints, signed, dated, numbered #1/1 (because I only make ONE ACEO card for each painting!). 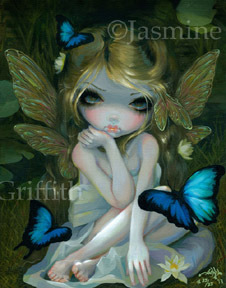 All of my ACEO cards are up for auctions starting at just one penny each! Jasmine will NOT be there this weekend but will return in person October 5 & 6th! 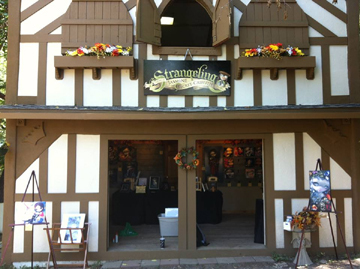 Amber & Chris (my sister & her husband, of StrangelingEmporium) will be running my booth this weekend while I travel back home to Florida. Lots of my artwork is there though in my stead! And now - we have my new "Owlyn" cloth dolls here too! I will return for one more weekend - October 5 & 6th. Our house is shown above - a two story half-timbered Tudor style house with the Jasmine Becket-Griffith logo above the door, and Jasmine art out in the front yard. The booth number is #251 on Westover Way (previously this was Nene Thomas' house, so if you have been to the Festival before you will find it! ).